This product has been discontinued and is no longer available. Please refer to Sims part number 02184000214GYS (door assembly), and select option 1700-3365S (LH & RH Soft Sides - Clear Poly Vinyl Curtains). 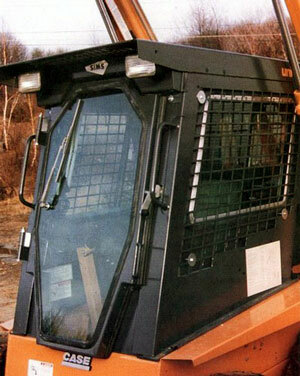 All steel and glass front door assembly with vinyl side/rear panels that converts skidsteer open ROPS station to an enclosed operators cab. Includes electric wiper motor assembly. Note for 1835C units only: Serial number of skidsteer is required. This enclosure only fits 1835C units with serial numbers less than JAF0037367. (There is no restriction for 1838 or 1840 skidsteers).